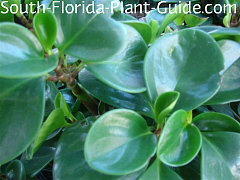 Sometimes called "Baby Rubber Plant," peperomia has thick, waxy leaves and makes a beautiful low groundcover for shade. 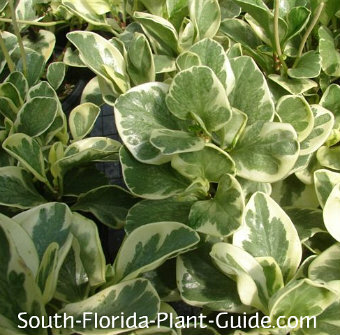 The variegated variety is the showiest, with its creamy-white and green foliage. The all-green one has dark, emerald-green leaves almost too pretty to be real. This plant is used as a fairly slow-growing groundcover...or as an accent in a shaded area. It doesn't send out runners like other groundcovers but instead grows in a spreading clump with stems that lean outward and stay low from the weight of its heavy leaves. 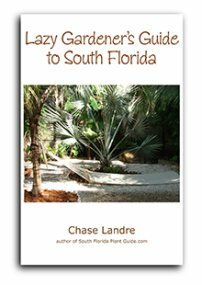 It's an ideal plant for the armchair gardener or South Florida snowbird because it's so easy to care for and drought tolerant once established. Though it loves the humidity we have here, it doesn't like to be kept overly wet. This is a wonderful plant for shady spots - anything from dappled shade to a bit of morning sun to full-out shade works fine. The growth rate is slow to moderate, and because of the way it grows the plant rarely reaches a height of even 12 inches. These plants need the warm temperatures of Zone 10. In Zone 9B you can grow this plant in a container to bring indoors during cold snaps. No soil amendments are needed. 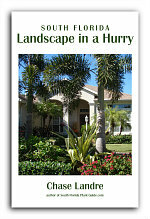 Little - if any - trimming is necessary, usually only to tidy up the edges of the planting bed. This plant must have well-drained soil. Mulch sparingly so it doesn't stay wet. Water on a regular basis but allow plenty of time between waterings for the soil to dry out. If the plant is well established, no watering is absolutely necessary except during dry spells, though well-timed regular irrigation is preferred. Fertilize twice a year - in spring and late summer - with a top quality controlled release fertilizer. You can situate these plants as close as a foot apart to encourage them fill in faster. Come away from nearby shrubs about 1-1/2 to 2 feet. For planting by walks and drives, come in 1-1/2 feet. This plant grows very well in a hanging basket or other container, draping beautifully over the sides. 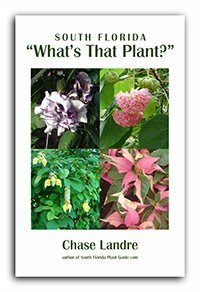 COMPANION PLANT SUGGESTIONS: Japanese boxwood, Xanadu philodendron, cordyline and dracaena, peace lily, heliconia, and pinwheel jasmine.